OXFORD, Miss. 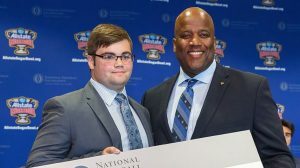 – Cameron Hammers, an incoming freshman in the Early Entry program at the University of Mississippi School of Pharmacy, has won a $10,000 Allstate Sugar Bowl Scholarship from the Allstate Sugar Bowl Chapter of the National Football Foundation and College Football Hall of Fame. A senior at Pope John Paul II High School in Slidell, Louisiana, Hammers wrote his winning essay about his past struggles and personal philosophies that have helped him learn to work hard and succeed. He credits his parents with encouraging him to never give up. “My reaction was one of excitement and disbelief, and I was happy to be honored with the scholarship,” Hammers said. Hammers accepted a spot in pharmacy school’s competitive Early Entry program earlier this spring. Upon earning his Doctor of Pharmacy degree, Hammers hopes to make an impact on the problem of over-prescription of opioids and antidepressants, and he plans to pursue nuclear pharmacy. David D. Allen, dean of the Ole Miss School of Pharmacy, said he is “incredibly proud” of Hammers.